EVE Academy is a bespoke online resource and learning platform, prepared to deliver progressive learning, to help you and your staff improve customer service and increase sales. The courses, cover every aspect of using EVE. The learning is delivered ithrough progressive modules, easy to follow and quick to complete. There are over 230 lessons availablle, compiled into 37 appropriate modules, and include, Lesson prerequisites, Text, images and video within the lessons. EVE Learning, is for all levels of EVE Users, from 1st time users, through to experienced operators . Ideal for supervisors, managers and system administrators, who wish to learn more. Staff, wishing to further their careers, increase their role within the dive center, may enrol into the EVE Academy and learn to master the duties of their new roles prior to starting. Dive centre owners may even elect to use the learning as a pre-requisite for a new appointed positions. New staff, may pre-learn EVE functionality, aligned to their applied for position and arrive ready to work. EVE Academy, helps to make your staff better prepared to provide the high level of customer service you would like your divers to receive. Staff are awarded recognition and certification upon completion of each course. Dive Centers new to EVE, may request free access passes to help their staff to get going with EVE Learning. While you are having EVE installed, they will be learning how to get the most from EVE and hit the ground running, when you are ready. Dive centres using EVE, are elegible to receive training passes for their existing staff. We want you to get the most out of using EVE. Email: support@evediving.com Using Exisitng EVE Centre Academy Passes as the subject heading and you will be provided with the details of how to access your training programs. IDC centres and Course Directors, may offer EVE Online Training as part of their career development curriculum, or as an adjunct to their IDC's. Students can register and take courses, training to work within dive centres using EVE. If they are working for your dive centre, you may elect use one of your annual free access passes fro their training. Either way, your new staff member arrives better prepared for work. Want to view an example lesson? Click on the following link to sample a free lesson -Creating a New Course . 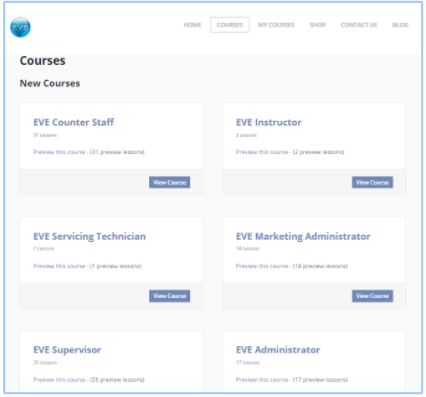 View an expanded Preview list and after, why not contact support@evediving.com for further detailed information about the EVE Academy range of courses. Note: When in Preview mode, access the first lesson, by clicking on the top blue bold lesson title. Once you reach the bottom of the page click the left hand or right hand grey arrows to view the next or previous preview lessons.